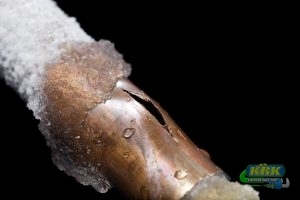 Frozen Pipes Can Turn Into Burst Pipes. Winter plumbing issues are important to pay attention to. 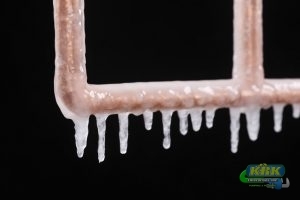 When the cold starts to take over, the problems with your plumbing can go up. Things like frozen pipes and failed water heaters are all issues that can happen before you know it. There are ways to prepare and make sure that you aren’t stuck in the middle of having to call a plumber in the dead of winter to come thaw your pipes out. First things first, your winter plumbing and heating will need to be checked out before winter even starts. If you haven’t had an inspection done, you should do so as soon as possible to make sure that your system is good to go. Residential plumbing is so important to pay attention to in the winter time. When temperature drop into the freezing zone, your pipes can start to freeze and actually burst. To avoid that, you can do a few things. You can keep the temperature of your home, warm and open up your cabinets to keep your pipes warmed. You can also let your hot warmer drip from your sink at a constant level. If your heating system is having trouble keeping your house warm in the winter, you can call about having a heating system service to get it ready and properly prepare for the issues that the cold can bring. You will want to know the different ways to winterize plumbing around your home. How do you insulate water pipes outside? Water pipes that are outside should be insulated before they are installed underground. The ones that are above ground can be done in a few simple steps. The insulation goes around the pipes and is then sealed so that the air cannot get out. This will help keep the pipes from freezing and can lower your energy bill as well. Can pipes freeze if water is turned off? If the water to your home is turned off, the inside of your pipes don’t freeze. If there is water inside your pipes that is just sitting in there, it may freeze, but nothing will come of it. A pipe burst or frozen pipes, happen when, there is water pressure that has built up from the water being on. The best thing you can do if you leave your home in the winter, is to turn your water off. How do you drain plumbing for winter? When you need to drain your plumbing for winter, to avoid getting stuck with a frozen pipe or a pipe burst, you will first need to turn off the main water valve. Then you can turn on all of the water fixture in the house until water stops coming out of them, this means flushing the toilet too. Once the water is all gone, you can use an air compressor to shoot air into the main line drains. The water will be forced right out of the lines. You can put non-toxic antifreeze into your sink drains and bathroom toilets to keep your pipes even more safe from freezing. How do you winterize water lines? We mentioned the steps above, but if you want to make sure that you have extra protection, you can also put covers on all of your outside faucets. This will help to keep them insulated enough to not freeze during low temperatures. It is important to know how to winterize plumbing in case you have to do it yourself. How do I prepare my plumbing for winter? To winterize plumbing beforehand, you will want to make sure that all leaks and repairs are taken care of ahead of time. You can also make sure your water heater is working correctly but scheduling a tune-up. Cover all of the outdoor faucets with special insulated covers to help keep them from freezing. If you haven’t already you can have your pipes wrapped to help keep the warmth inside. How do you keep your pipes from freezing without heat? We like to say prepare, prepare, prepare. You will want to follow all of the advice above. When it is freezing outside, it is important to not open doors to the outside and try to stay inside as much as possible. When you let the cold air in, in an already cold condition, you are opening yourself up to a higher possibility of having your pipes freeze. Know What To Do In The Event Of Burst Pipe To Avoid Further Damage. You will want to make sure that you winterize plumbing around your home to avoid a frozen or burst pipe from happening. It can be a huge problem if your pipes end up bursting and can end up costing you a lot of money in damages. If your pipes freeze and you don’t know what to do, make sure that you call KRK Enterprises, Inc. at 800-330-7686 and we will come out to you as fast as we can. If you need help to winterize plumbing around your home in Fort Pierce and Port St. Lucie, Fl, we are here to help.